Periscope is being talked about as the new kid on the block. The live-streaming social media channel has gathered over 10M users already. It’s a very clever piece of software. Rival software Meerkat is clever too, but it doesn’t have the backing from Twitter that Periscope does. Twitter run and own Periscope and this is the main reason it’s been so successful so fast. Signing up (on boarding) is so simple and so fast that you can’t really get it wrong and you have an audience almost right away thanks to the power of Twitter. But did we just let an anti-social media in the back door? Can Periscope really be called ‘social media’ when it goes against everything social media stands for? 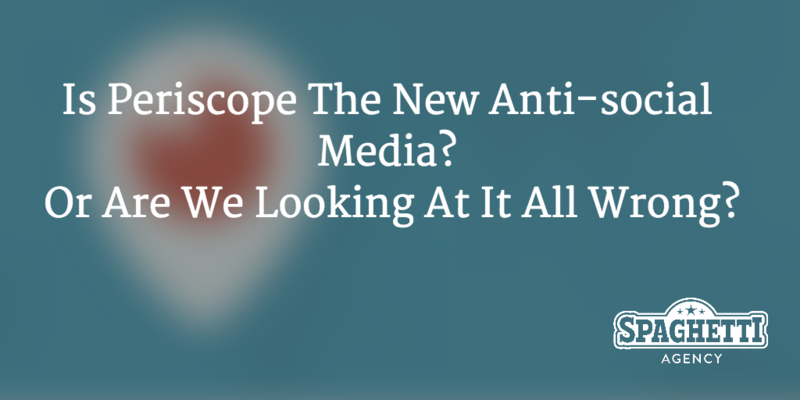 This week on a forum post I saw a comment about Periscope heralding it ‘anti-social’ media. The commenter on this forum made a fair point, saying that actually the broadcaster is very much in control of the show and the viewers can only interact by commenting with short texts. The attention is very much on the broadcaster, unlike a Twitter conversation for example, where you all have the same tools and function… or Facebook where the fans’ content is often way more significant than the Page owner’s content. I’m inclined to agree on these points – but I think there’s another side to this. For me, social media is all about engaging but more importantly – listening. Taking an interest, listening, monitoring conversations, and hearing what others say about you or your industry is where social media comes into its own. But Periscope doesn’t do that, so why would I disagree with the anti-social argument? Periscopes or Scopes are called broadcasts… kinda the opposite to social media and listening wouldn’t you agree? So isn’t the commenter in that forum right? Plenty of people I speak to only watch… so they’re listening to Periscope. I think Periscope is a superb tool for business too. The ability to see the people behind a business is very much what makes social media so great. Live interaction with a brand or business has so many options when you think about it. I firmly believe we’ll see some amazing new use of Periscope in 2016. For me, Periscope allows you to show the people behind the business in real life, in real time and that’s a very powerful way to interact with your audience and fan base. But the argument is this: isn’t Periscope all about broadcasting… and isn’t that opposite of social? 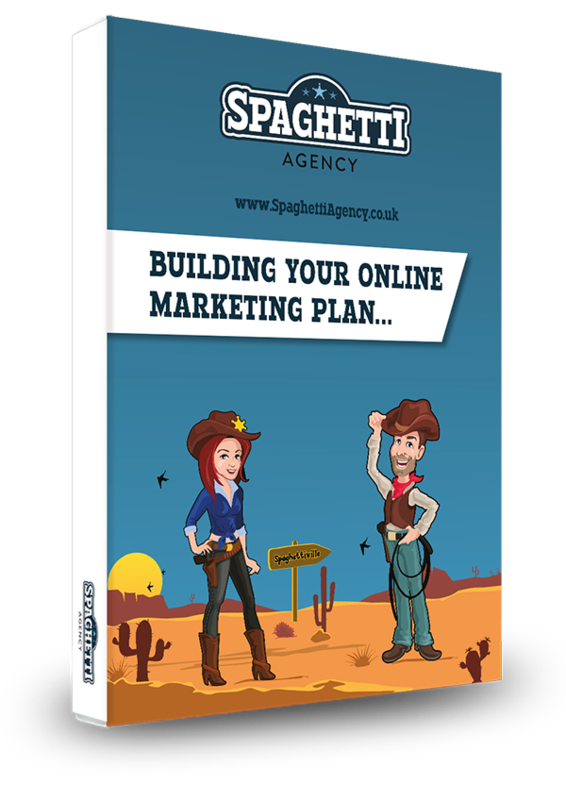 Social media should be about offering great quality content to your audience. Periscope can and does do that. Of course it’s down to the broadcaster if they do or don’t, but then that’s the same on social media channels, right? A good Periscope chat offers so much value. I follow many leading marketers and they’re sharing some awesome value through their streams. They’re giving away tips and telling their followers how they make their huge profits. That’s pretty cool. The live element of this also makes it so much more real. You know that they’re saying this stuff – you can see the words coming out of their mouth. There’s no hiding on Periscope! You can see what people are like at pubic speaking – warts ‘n’ all. Yes – you can have engagement on Periscope. Those live comments are perfect for it. And you can see whether people like what you’re saying and doing because if they do like it, they’ll give you hearts. Instant feedback. You can have a conversation with people using comments on Periscope and I’ve seen shows where people only do what the comments tell them to. There’s a guy Jo discovered called Craig GC, who plays any track on his guitar that the commenters type. It’s genius on a music and social angle. You get to see his talent and his wit, and you get to drive the conversation and direction of the show – perfect social media. So I’ll agree that if you’re broadcasting you can’t really listen, apart from in the comments. But you can watch loads of other Scopes when you’re not broadcasting. You can follow experts, competitors, and people who buy from you or work with you. I think taking an interest in what people you respect and work with say and do is a powerful way to use Periscope. It’s not all about broadcasting… if it was then no one would be commenting on those Scopes. This is so instant that it’s actually faster than tweets. Twitter has always been held up as the fastest social media channel but I think Periscope just topped it – it’s live streaming. You can comment and get comments back right away, and of course you can reply to comments in the stream as a watcher too. YouTube comments (lol) are a nightmare. That’s not to say you won’t get trolls on Periscope but it seems harder to troll. You’re right there, live, with other viewers. When you have this ‘arena’ you get a pack mentality where other viewers will attack the troll on behalf of the broadcaster. I’ve seen it happen. We all hate trolls and now we get the chance to attack them back, live – we’re well up for it. I think this scares trolls off as I haven’t seen many on Periscope. Periscope is very adaptable and like all the great social media sites; Twitter, Instagram, Pinterest, Snapchat, it’s only your imagination that limits it. Scopes of sunsets in California. Periscope has the platform… The question is, do you have the imagination and drive to do something different? So is Periscope an Anti-social Media? Yes it is – if you only broadcast and don’t watch. Yes it’s anti-social if you only broadcast and ignore your comments. It is anti-social if you only talk about yourself and never offer any value, content, insight or tips and advice for your audience. But I think it is a social media channel worth looking into in more depth. It is social media in that it’s fast, adaptable and conversational. 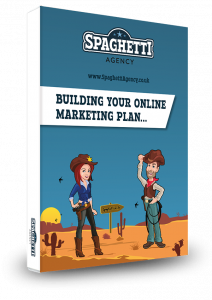 Used in the right way it could really boost your business, awareness and build you a good loyal following. Just broadcasting and not listening is not social media though… so keep that in mind for your next Scope. Video: A Scope I gave from Lanzarote that was streamed onto a big screen in a leamington networking meeting. What do you think? Have you got on board yet? Or do you think it’s just another fad? Or worse – you think it’s anti-social and led by megalomaniacs.